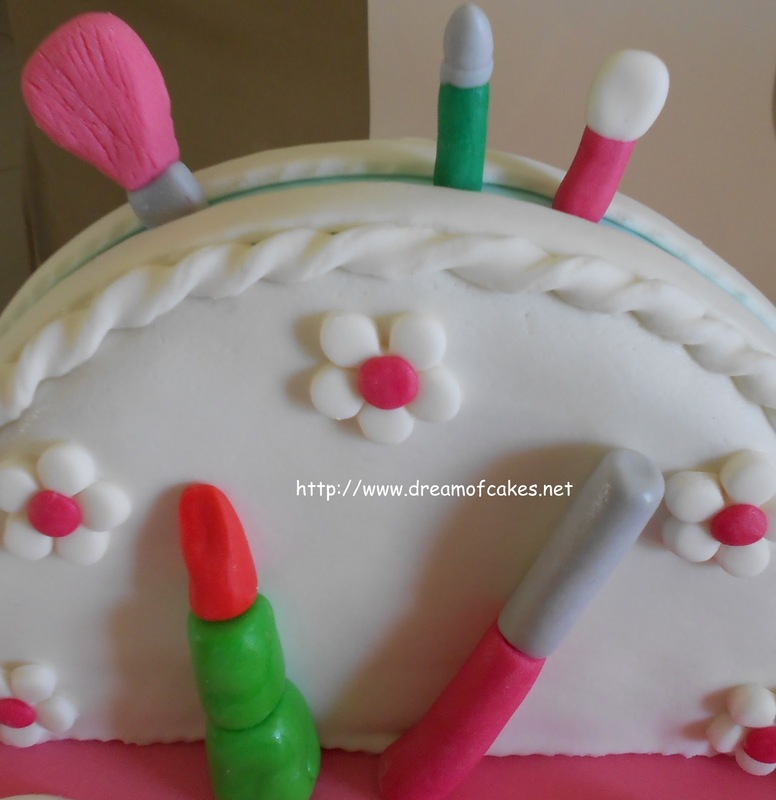 The idea came from Debbie Browns' Book "50 Easy Party Cakes", which I find a very good source for birthday cake ideas. The design was slightly different than mine. 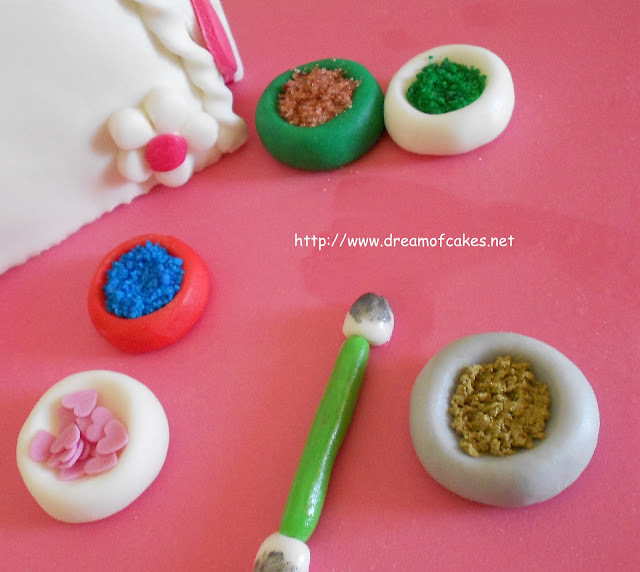 I used Gumpaste for all the makeup accessories and the eye shadows were made with sugar and edible powder. This is a second version of the same cake idea. If you would like to participate in my Giveaway please visit the post: Student Ideal Organic Energy Bars! Ha, ha. Very clever and beautiful. I bet Helena was so thrilled!! Glad to see that problem with comments has been solved. These are some beautiful cakes! Wowwwww - such beautiful cakes! I'm amazed everytime I see your work! 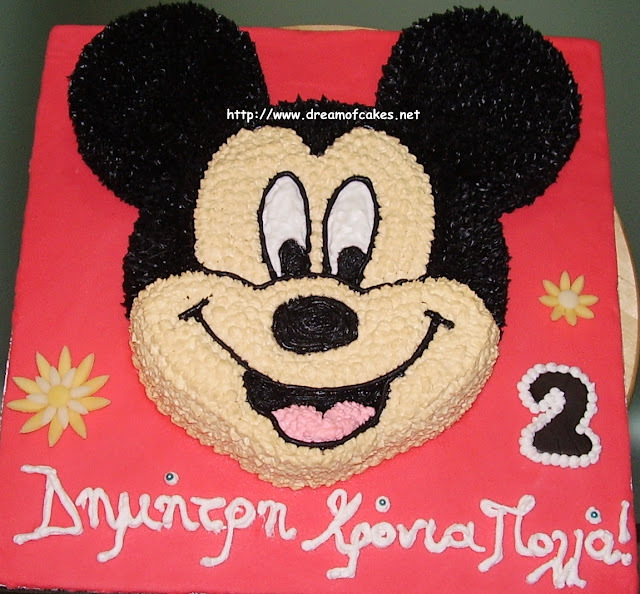 That is absolutely amazing--I am always astonished by your cakes! Your cakes never cease to amaze me! 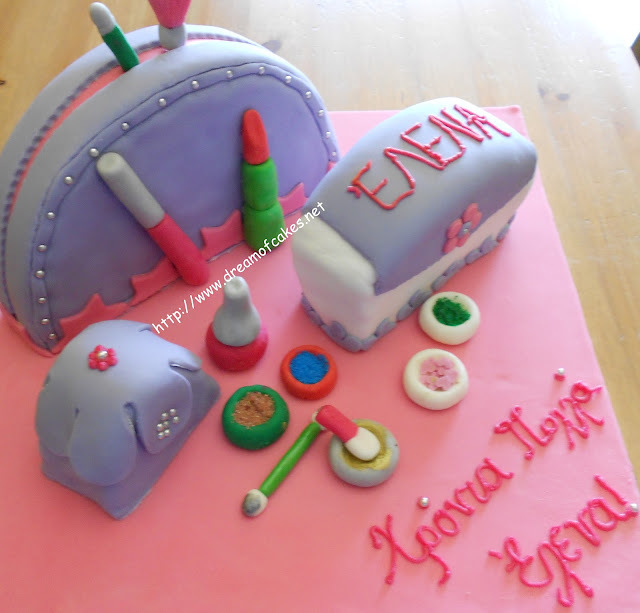 This is such a cute and very well done cake! 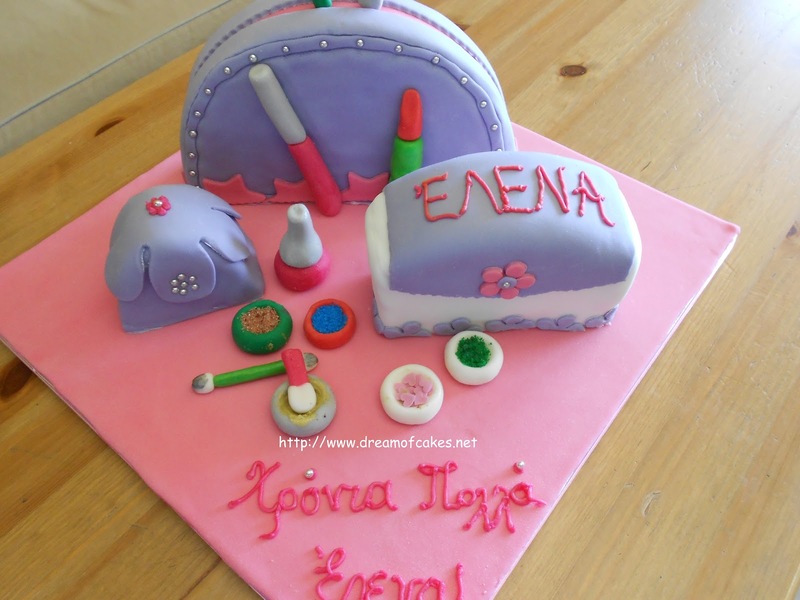 This is a perfect cake for a little girl! 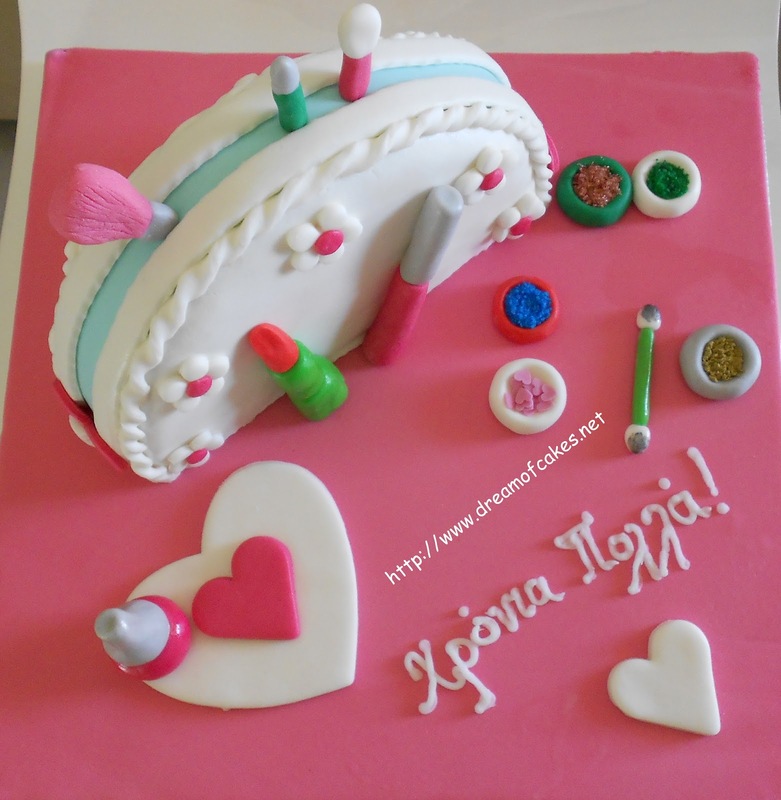 I think that you can turn any request into a cake you are so talented. I do remember several of your posts and I still love the teddy bear-its great to see it again in your slidshow to the left, it was probably the first cake I had ever seen of yours. Have a great day and be proud of your talented abilities! This is soo fantastic! I love all the little parts to it - amazing! So cute. I have never seen a cake like this before. Perfect for those tweens. Will you make this for me please?? I love it, amazing work!! Brilliantly done! 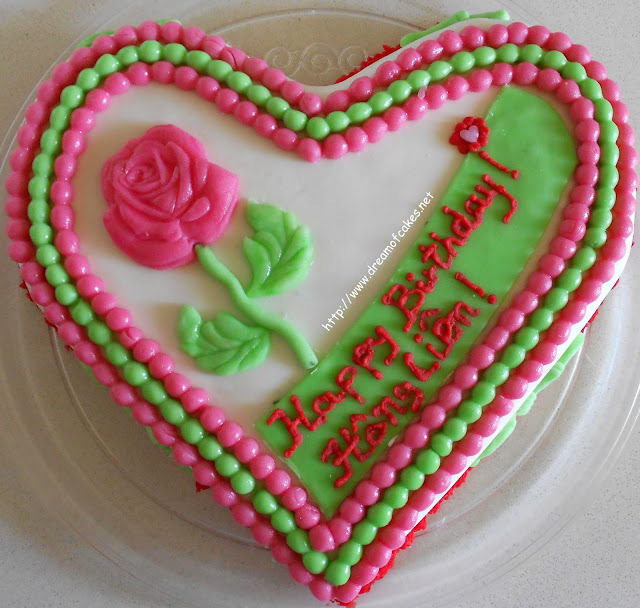 It's a young girl's dream cake! Beautiful cakes with wonderful presentation. This is so cute! Very well done! This is the cutest thing ever,so creative! So cute! I don't know how you do it - it's such a talent. :)Love it Eftychia! Again I will say, you are SO talented! What beauties!!! Wow! What a beautiful cake, so adorable! Definitely impressive! 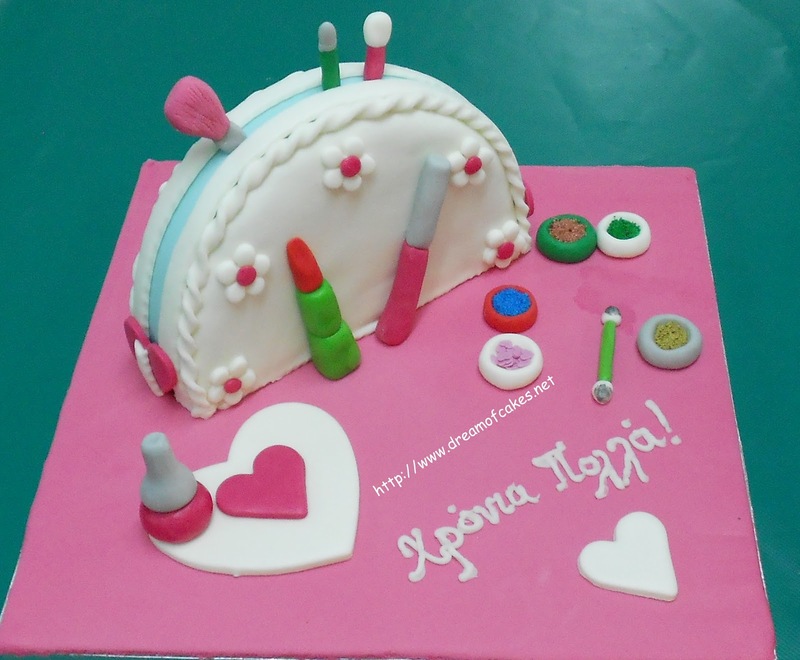 What a wonderful decoration of the cake! Awwww...it's perfect for a girl of ANY age!!! cute and interesting! good job! oh what a pretty cake!! Any girl will love this!!!! Hey girl. Thanks so much for stopping by my blog, saying hi and leaving a comment. Had to stop by here. Fantastic cake. I thought the text on the cake looked Greek but having looked at your "about" page I'm not sure whether you're on the Greek, or Turkish side of Cyprus. So forgive me if I'm wrong, lol. Always wanted to visit Cyprus, wonderful place. Hi Lisa, thanks for your comments. 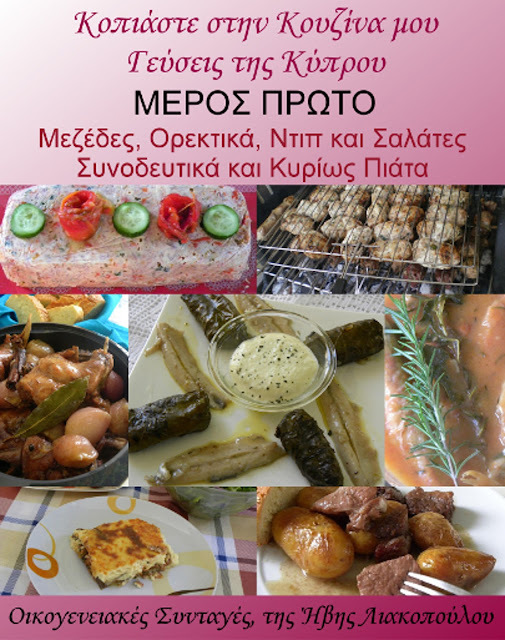 I am Greek-Cypriot and allow me to say that all Cyprus is Greek. Turks invaded Cyprus in 1974 and now they still have half of the island. We hope that we will manage to find a solution so Greek-Cypriots and Turkish-Cypriots will manage to live peacefully together. This cake is absolutely adorable. I have a birthday coming up this summer for a soon-to-be 7-year old nice, and she is really into makeup and nail polish, so I may look to your design for inspiration! And thanks so much for stopping by my blog and commenting! I'm new, so I get very excited when ANYONE, especially other seasoned bloggers, stops by for a look! :-) Have a great day! So cuute!! You have an outstanding talent. This cake would make any little girl feel so grown up and special. Adorable accessories that look like you could pick them up and use them for real! Kids just want to be kids and today's society pushes them to grow up too fast. Just visit your local shopping mall and see the clothes little girls are expected to wear - they all look like miniature adults! Why are we pushing them to be adults so soon? Let kids grow at the right pace; they need to have the time to enjoy the wonder of the world that is theirs to explore at their pace. And as adults, lets look through the world through their eyes as well. It's amazing how your perspective will change! ~Michelle M.